Places of Act is the name of a long-term project through which we try to bring public spaces to life through art. In past years, we have thus “awakened” empty and abandoned buildings, or buildings still waiting for their role to be discovered. These include a former dental clinic in Jungmann Street, the former Institute of Folk Art Production on Národní třída, a former casino (and former International Union of Students) in Pařížská Street, the ČKD warehouse in Karlín, the Holešovice brewery, the Šlechta restaurant in Stromovka, an old sewage treatment plant, the former Federal Assembly, the Prague zoo. and other places. 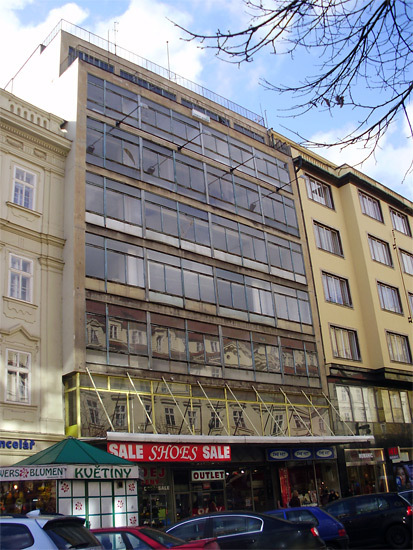 The seven-story functionalist building by architects Ludvík Kysela and Jan Jarolím once featured a famous and popular café, stores, housing, doctor’s offices, offices, a restaurant, and the famous Cinema Alfa. The building’s shopping arcade, which connects with the Světozor arcade and the Franciscan Gardens, was one of the jewels of Wenceslas Square. Thanks to its glass walls, one could observe life on the street and in the arcade, and slow down amidst the hustle of the big city. The ÚLUV building, a functionalist jewel on Národní třída, was constructed in 1936 by architect Oldřich Starý as the House of Artistic Industry for the Union of Czechoslovak Art. 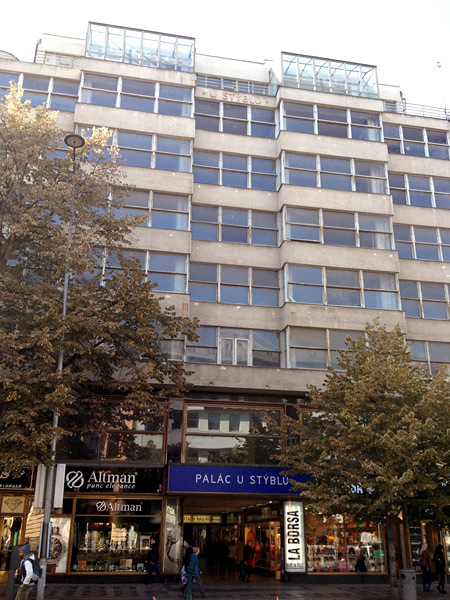 Many important personalities worked here, including Jan Kotěra, Josef Gočár, Ladislav Sutnar, and many others. The building housed a Krásná jizba (Beautiful Home) outlet and was the headquarters of the Družstevní práce (Work Cooperative) publishing house. The Center for Folk Art Production was founded after World War II in an attempt at promoting folk art. The 4+4 Days in Motion festival will open the building’s underground spaces to the public – originally a movie theater also intended as for exhibitions and public ceremonies. The auditorium was last open to the public 24 years ago for a 1990 concert by Lou Reed. Since then, it has been closed. An exhibition of contemporary art. Curators: Krištof Kintera and Denisa Václavová. 40 artists for the former Alfa discotheque. Installations, objects, paintings, videos, conceptual and site-specific art, and more. Get to know your city and its public spaces. 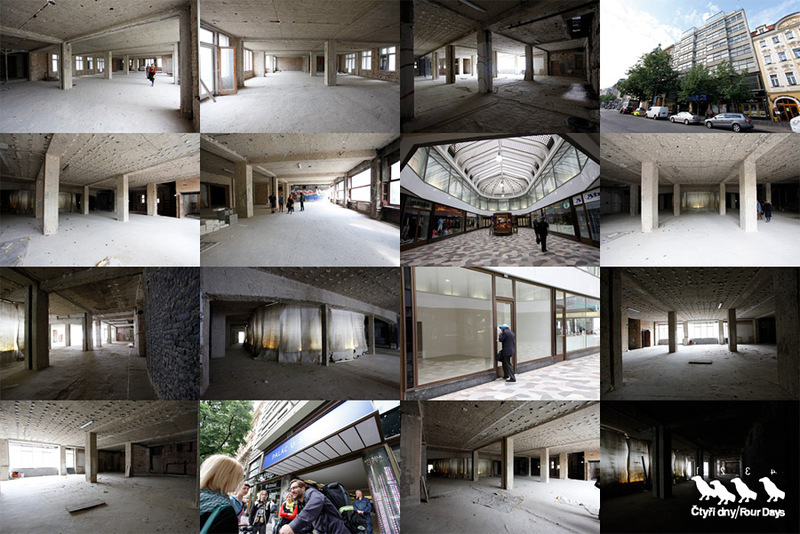 Specific, personal looks at a selected locality – Wenceslas Square and its immediate environs. THE CULTURE BOSS OF IT ALL. Discussion with Respekt magazine. Who at Respekt magazine decides what the culture section will writer about? The editor-in-chief? The main editor? The head of the culture section? The reader? Mr. Bakala, the owner? Must the reader be always interested in what interests the culture editor? And must the culture editor be always interested in what the readers are interested in? Kamil Fila, Pavel Turek, Pavel Kroulík, and Jan H. Vitvar discuss the question of who is the boss of culture. Moderated by Adam Gebrian. We invite all contributors, readers, friends and opponents of Artalk.cz to a celebration of the site’s 6th anniversary in collaboration with 4+4 Days in Motion. Beer, wine, snacks on the bar + an accompanying program featuring an auction of items and experiential encounters with theorists, gallerists, curators and artists; plus a performance by Vojtěch Fröhlich and DJ Radeq Brousil.